This excerpt is from one of the last conversations I had with my dear late mother, who passed away some seven years ago, still remarkably frugal at age 99. Her words reflect a view seemingly held by half the world’s population: Water is boring. The other half of the world, though, fanned by pseudoscience and new-age gurus, seems to buy into magical properties like homeopathy, structured water, polywater, and water memory. 1. How Many Kinds of Ice Are There? The remarkable variety of crystalline ice forms results from the tetrahedral network of strong hydrogen bonds formed among neighboring water molecules. In the condensed phases of water, each molecule optimizes its hydrogen bonding capacity by forming four hydrogen bonds at near-tetrahedral angles. The hydrogen bonds inside Ice Ih form an open, three-dimensional structure with a low density. The application of pressure to tetrahedral substances, including crystalline ice, elemental carbon, silicon, and phosphorus, can collapse low-density solid forms into a variety of structures of sequentially higher density, presumably until the close-packed limit is reached. This produces the 17 forms of crystalline ice we have observed so far. Are there more to discover? 2. Are There Two Kinds of Liquid Water? Several decades ago, Japanese scientists claimed to have observed transitions between two phases of amorphous ice under high pressure. Since we believe that amorphous ice is essentially a frozen snapshot of the corresponding liquid, this observation implied that two types of liquid water must exist: normal, low-density water, and a compact high-density form analogous to high-pressure amorphous ice. Subsequent simulations have supported this claim. They investigated water whose temperature was below freezing, but above its “homogeneous nucleation temperature” (the temperature below which liquid water cannot exist). In this so-called “deeply supercooled” region, scientists saw evidence for a phase transition between two liquid forms of water. However, other scientists argue that these results are artifacts, and that such transitions are unlikely to occur, based on principles of statistical mechanics. The fact that they occur so far away from equilibrium makes them difficult to observe and model—in fact, behavior far away from equilibrium is a current frontier of condensed matter theory. 3. How Does Water Evaporate? The rate of evaporation of liquid water is one of the principal uncertainties in modern climate modeling. It determines the size distribution of water droplets in clouds, which, in turn, determines how clouds reflect, absorb, and scatter light. But the exact mechanism for how water evaporates isn’t completely understood. The evaporation rate is traditionally represented in terms of a rate of collision between molecules, multiplied by a fudge factor called the evaporation coefficient, which varies between zero and one. Experimental determination of this coefficient, spanning several decades, has varied over three orders of magnitude. Theoretical calculations have been hampered by the fact that evaporation is an extremely rare event, requiring prohibitively long and large computer simulations. Together with his colleagues, David Chandler, of the University of California, Berkeley, used a theory capable of describing such rare events, called transition path sampling, to calculate the water evaporation coefficient. They arrived at a value near one. This corresponds fairly well to recent liquid microjet experiments that produce a value of 0.6 for both normal water and heavy water. However, there are a couple of wrinkles. For one thing, it remains unclear why experiments performed under more atmospherically relevant conditions yield much lower values. Also, the transition path sampling simulations suggest that evaporation relies on an anomalously large capillary wave running along the liquid’s surface, which strains and weakens the hydrogen bonds holding on to an evaporating water molecule. The addition of salts to water raises the surface tension and suppresses the capillary wave amplitude, and so should reduce the evaporation rate. But experimental studies show little or no effect when salts are added. 4. Is the Surface of Liquid Water Acidic or Basic? 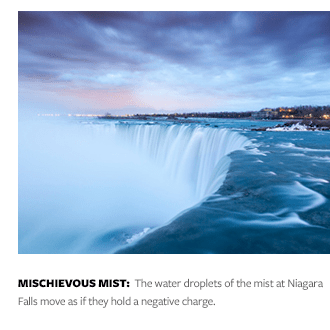 There is something remarkable about the mist surrounding Niagara Falls: The individual droplets move as if they are negatively charged. The same is true for most waterfalls. This has long been interpreted as evidence for the accumulation of negative hydroxide (OH-) ions at the droplet surfaces, which would mean that the surfaces are basic—with a pH value greater than the 7 of neutral water. In fact, this thinking has become dogma within the community of colloid scientists. The surface of liquid water contains a larger number of broken hydrogen bonds, which produce a rather different chemical environment than that found in the bulk. But recent experiments and calculations suggest that hydrated protons (H+) actually dominate the liquid water surface, producing an acidic (less than 7) pH and a positively charged surface, rather than a basic, negatively charged surface. Many important processes in chemistry and biology, like atmospheric aerosol–gas exchanges, enzyme catalysis, and transmembrane proton transport, involve proton exchanges at the water surface, and explicitly depend on the pH at the water’s surface—a quantity which is currently unknown. 5. Is Nanoconfined Water Different? Water isn’t always sloshing around in giant oceans. Both in nature and in man-made devices, water is often confined to unimaginably tiny spaces, like reverse micelles, carbon nanotubes, proton exchange membranes, and xerogels (which are highly porous glassy solids). Both experiment and calculation seem to indicate that water confined by solid walls to tiny regions of space, whose size is comparable to that of a few hundred molecules, begins to exhibit quantum mechanical effects, including delocalization and quantum coherence. These properties are strikingly different from those of bulk water, and could influence everything from biological cells to geological structures. It could be also be of considerable practical significance, for example in designing more efficient desalinization systems. Current results remain somewhat ambiguous, however, and more work in this area remains to be done in order to determine the nature of water under confinement.